May 14, 2018 – Cape Coral, Florida – Eclipse Corporation, provider of DocOrigin, an enterprise forms, documents and customer communications software solution, announced today the 5 year anniversary of working with their OEM customer, Advantage 360, through their partner ProTechnology, Inc.
Business Communications Center provides a robust software solution which allows Marketing, HR, and Legal departments to create campaigns, messaging, and manage legal T&Cs without engaging IT for ongoing projects. Now, the design and delivery of transactional documents that serve as a vehicle for custom marketing and messaging are put in the hands of the stakeholders within the business. Advantage 360 (A360) is a leading provider of customer care and billing systems for the Telecom industry, providing convergent billing for wired, wireless, internet, and satellite services. They have a global customer base ranging from North America to Mali to the Caribbean with installations in 200+ customers in more than 30 countries. In 1999, A360 needed a document and forms generation solution embedded in their software. Working with ProTechnology, A360 selected a tier one provider of forms software, which in the 90s met there needs. Unfortunately, the technology was sunset and the replacement software from the original vendor was much more complex, expensive and would not perform as well as the software they had been using. In 2012, A360 was in need of a replacement for the sunset Adobe Central product so they went to their trusted partner, ProTechnology. Dan Roth, CTO and founder of ProTechnology introduced them to DocOrigin. 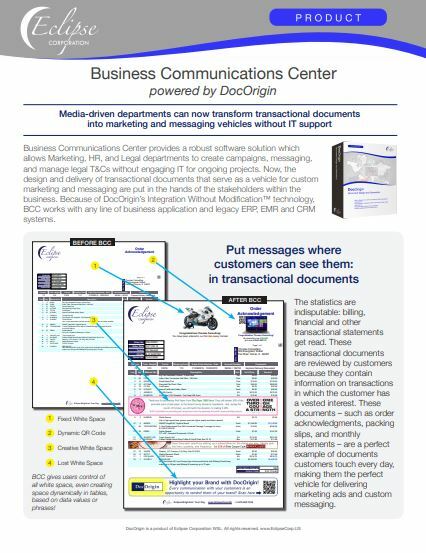 Bob Hennemann, CFO at Advantage 360, said selecting DocOrigin and ProTechnology was a “no brainer”, they continue to expand the use of DocOrigin to improve omni-channel communications with clients. DocOrigin generated Telco bill – Data driven marketing and targeted messaging for business documents! Up-sell, cross-sell and run your campaigns without IT involvement. “DocOrigin improves Advantage 360’s products by simplifying their software development processes and allowing for much easier design and deployment. Plus, the omni channel communication delivery features, like print, email, web, XML, cloud fax, SMS, portals and more, have increased the value of the A360 offering to their clients. DocOrigin gives them a major advantage to compete in a global market.” said Eclipse CEO, Steve Luke. A leading provider of enterprise document composition, presentation, automation and customer communications management software. Eclipse and it’s partners works closely with clients to provide tailored solutions that conform to specific needs at a fair price. Since 1984, Advantage 360 has developed and continually evolved forward-thinking carrier-grade billing, POS, CRM and operational support software that is designed to reach well beyond their customers to their customer’s customers, and to provide an exceptional experience at every level. Founded in 1996, ProTechnology has delivered and supported enterprise forms and communications software solutions for hundreds of customers. ProTechnology provides complete solutions for document design, workflow and ECM. From evaluations, design and implementation to annual support we take care of our customers for the life of their requirements.